1st 40 characters are free on every golf trophy, extra engraving is 7 cents per characters and charges will be emailed to you. Date you need your golf trophies. 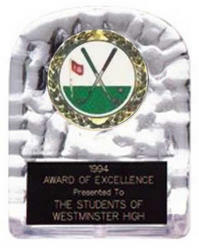 Acrylic block ice golf awards are an economical way to reward your golfers and sponsors. Available in 3 sizes, you may choose the insert that best fits your golf league award program or we will ship the mylar insert that is in stock. 40 characters of free engraving are included, if more is needed it's only 7 cents per character. We suggest you bookmark our site and come back often. Our store hours are Monday - Friday 8:30 to 4:30 Central Time, you may order on line safe and secure anytime. Begin your hassle free golf trophy shopping today. If you have any questions please call or use the email link below. If you have any questions or would rather place your order by phone, please call 1-800-787-8777. Business hours are Monday - Friday 9:00am to 4:00pm central time.